First things first: to access the T3 Feeds, use the button on the main view. This will bring you the T3 Feeds view which will by default load the International feed. If there is no network access, a message will warn you and no data will be fetched. T3 have different locals (languages) for this feed. If your device is found matching an available feed, it will be used, otherwise, the German will be used as default. On the upper side of your screen, you can choose which feed you want to check. Choose a feed and the the list will update. Since the 1.4 version, you can filter the feeds by the game system. Press the menu button and select Filter. From the dialog box, you can choose the game system by which you want the feed to be filtered. That list only displays the game systems available in the current feed. If you select another field, the filter will still apply. This is because filtered lists can be requested by other apps (such as the Alkemy Companion which ask the list of Alkemy tournaments). But the displayed field may not contain such tournament. So, you would want to check another feed. In such case the filter should still apply. And it does. To remove the filter, simply choose the Reset button on the dialog. The Cancel button is there so no action is made following the Dialog display. Tournament details and related features. The following applies to either the T3 Tournaments details and your tournaments details. A single tap on any tournament item in the list displays the tournament's details in a dialog (in another view for your tournaments). From this detailed view, a tap on the location block will launch Google Maps (or will ask to choose between the apps responding for that request), search for the location and display it on the map. 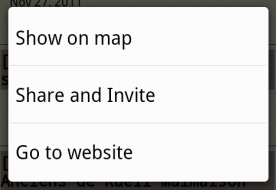 show on map will open Google Maps just as a tap on the location details. Share and invite will propose you to choose between the different communication apps so you can tell your friends about the tournament. Go to website will open the browser (or let you choose between the available browsers and open it) to the Table Top Tournaments web site tournament page. To be precise: it will open the web page associated to the tournament. So, on your tournaments list, it will open the web page you have chosen. This is about the T3 views. 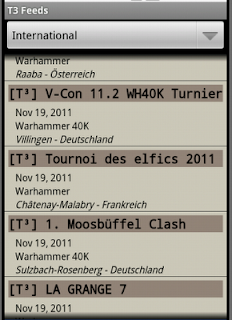 On your tournaments details view, those features and more are also available in the menu. 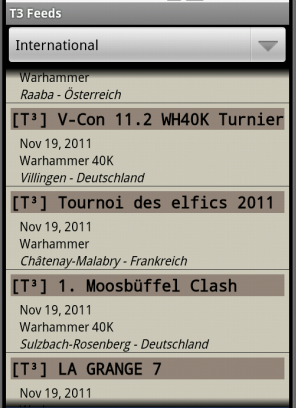 Click the Menu button on your Android device to see what is available for your tournament. We hope you discovered new useful features here. So, how useful are they ?